Elizabeth Blackburn, PhD (image credit: Rob Searcey). Used with permission of Salk Institute. 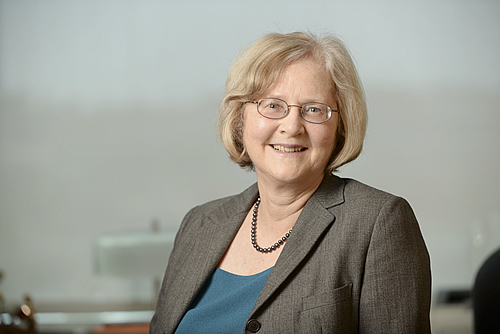 GSA member Elizabeth Blackburn has been named as the next president of the Salk Institute for Biological Studies, an independent research institute in San Diego founded by polio vaccine developer Jonas Salk. She is currently Morris Herzstein Professor in Biology and Physiology in the Department of Biochemistry and Biophysics at the University of California, San Francisco. Blackburn, who served as a member of the GSA Board of Directors 2000–2002, received the 2009 Nobel Prize in Physiology or Medicine “for the discovery of how chromosomes are protected by telomeres and the enzyme telomerase,” sharing the prize that year with GSA member Carol Greider and 2000 GSA Medal recipient Jack Szostak. Telomeres serve as protective caps at the end of chromosomes, which are maintained by the telomerase enzyme; these caps are thought to play a key role in aging and diseases such as cancer. Blackburn was also honored with the 2006 Gruber Prize in Genetics. Many GSA members have been affiliated with the Salk Institute, including current members Sreekanth Chalsani, Joanne Chory, and Joseph Ecker—as well as Nobel laureate Sydney Brenner, who established C. elegans as a model organism with a landmark 1974 paper in GENETICS. Blackburn will be the first woman to lead the Salk in its 55-year history. In an interview with Science Insider, Blackburn said that she plans to use her new position at Salk to promote support for and understanding of the importance of basic research. Salk Institute, “Nobel laureate Elizabeth Blackburn named Salk Institute president,” November 18, 2015. Emily Underwood, “Elizabeth Blackburn to lead Salk Institute,” Science Insider, November 18, 2015.